A wide range of Displays, Articles, Resources and Publications were collected and created as part of the 100 years commemoration of the First World War. They can be accessed in these pages. The People - the story of someone from Marlow who died 100 years ago in the War. An exhibition at Marlow Rowing Club (11-Nov-2018) to commemorate the 19 club members who served and were killed during the First World War. We researched how the town responded in 1916 to the introduction of conscription and especially the work of the Marlow Military Tribunal that heard appeals against conscription. We published the results of our research in the 2016 volume of Records of Buckinghamshire. An offprint of the article is attached here (pdf 1.2mb) and is reproduced courtesy of the Buckinghamshire Archaeological Society. In the late 1980s, members of the Marlow Society recorded interviews with people from the town who had lived through and remembered World War One. The transcript of those interviews is attached here - it provides a fascinating insight into how the War changed the town and its people. One of Marlow&apos;s many contributions to WW1 was the training trenches in Pullingshill Wood. From Beer to Bombs - The impact of the First World War on the Wethered Brewery, which was the largest employer in Marlow in 1914. Armaments production at the brewery and the role of women. 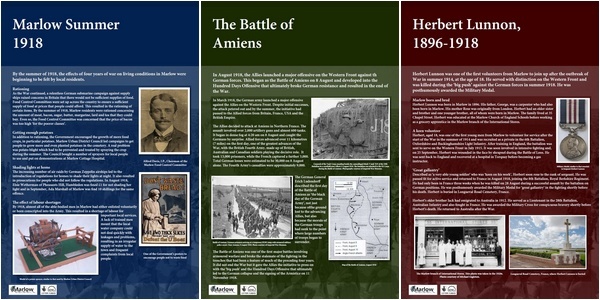 This resource pack has been created to provide teachers with information and lesson ideas specifically looking at Marlow during World War 1. All the resources to teach the lessons are either included in the pack or material can be downloaded from web links. The pack is aimed at Key Stage 2. However, some of the activities could easily be adapted for younger children. There are 4 lessons in the pack that can be taught together in sequence or as stand-alone lessons. This Excel spreadsheet documents the names and details (where known) of over 840 people from the Marlow area who served in the First World War. Over 230 men and boys from Marlow and the surrounding area served and died in the War. As a fitting tribute to their sacrifice, we planted a Remembrance Cross for each of them by the memorial in The Causeway on the 100th anniversary. Over the 2014-2018 period of commemoration we arranged a range of events and activities.